May 19th, 2014: Today was Day 18… Now this is what I call hiking! 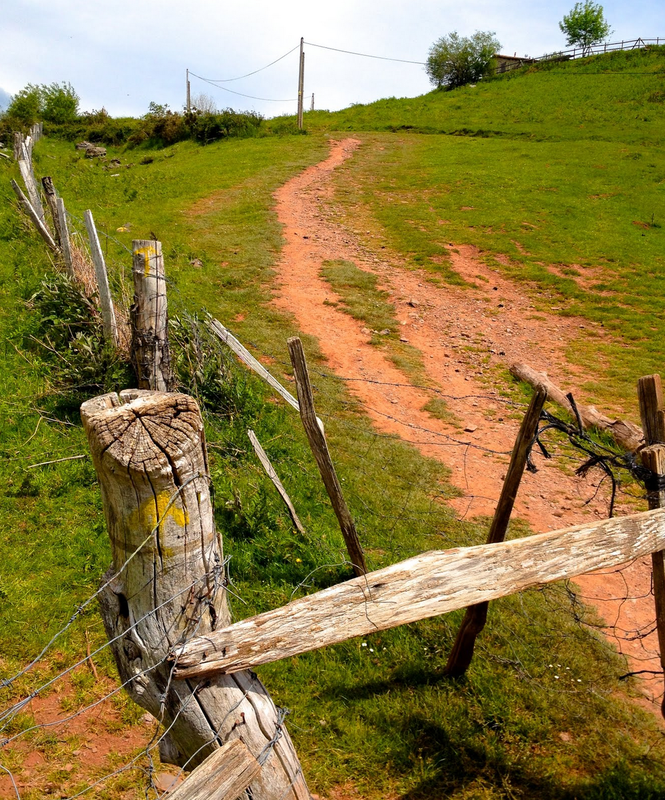 Hiking El Camino de Santiago- today is the first day I truly feel like we are doing that! I have hiked many mountains and camped all along the way, but I have never before hiked for days straight of endless kilometers of concreted highways. Today confirmed for me what I thought over the last few days. 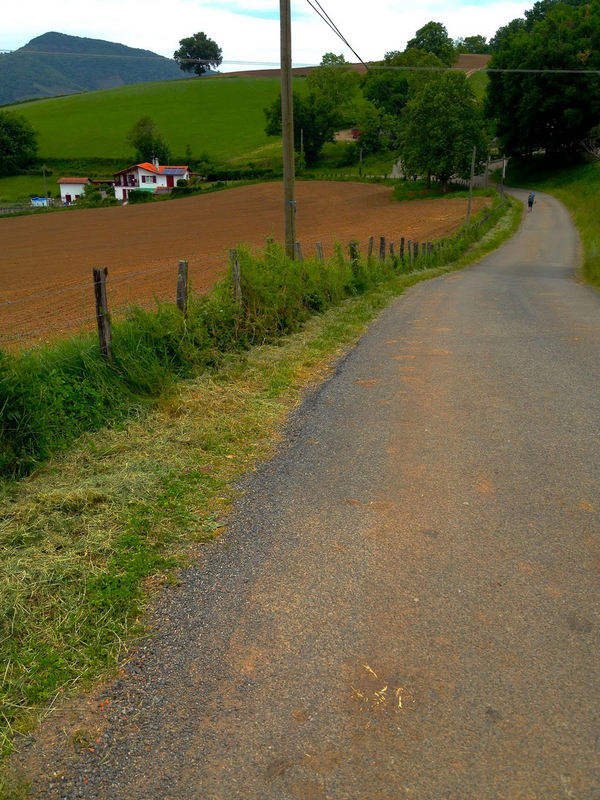 Lourdes to Saint-Jean-Pied-de-Port was our prequel, so to speak, to the rest of El Camino. It was a burden of love and deep, emotional intentions, but it was not unsolicited. It was our “pilgrimage-price-to-pay”, not only to begin a hike full of love and remembrances of my Mom, but also to break in our legs, and get used to the daily. And by “the daily”, I mean exactly that. For the next month and a half, the daily will consist of a constant flow of nothing, except sleeping, hiking, contemplating, writing, eating, and performing daily chore rituals necessary to the success of our pilgrimage. These are the basic essentials of our lives now, and the only ones that matter. Each day, we have to be prepared to engage in the daily, and then, the next day, we repeat. Still in the vicinity of SJPDP, and even though we are technically still in France until tomorrow, we finally saw one of the first blue and yellow compostelle shell signs, that we have read are ubiquitous throughout the Spanish side of El Camino. As has been the case every day as we hike, since I am a stronger hiker than Shannon, I usually end up great distances in front of her. We have not technically hiked alone for an entire day yet, as we stated we would do in our rules. Instead, I usually hike ahead for upwards of 1-2 hours and then begin circling back to meet back with Shan. It has been a good system so far. We have severe inclines as we begin our ascent into the Pyrenees Mountains today. I have to be more conscientious of not getting too far ahead of Shannon. 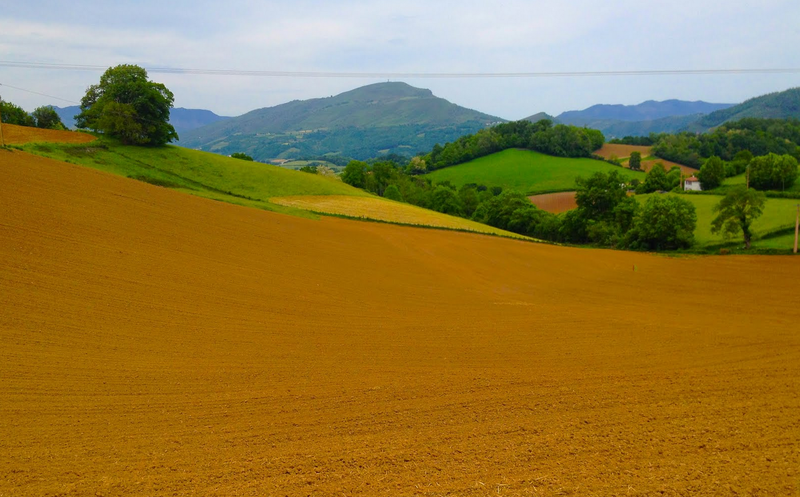 The mountains of the Basque region are breathtaking, and as we approach them, we come upon steep, rolling fields of fertile farmland. Because of the steep nature of our hike today, instead of hiking our normal 20-28 kilometers, we only have about 8 kilometers. With our first 3 kilometers out of the way, we come across the first sign of our reserved refuge for the evening- only 5 kilometers to go. So far, the hike has not been too challenging, so how hard could the last 60% be? With about 5 kilometers to go, I begin hiking at a furious pace. I figure I can hike ahead for about an hour and a half and be very close to our resting place. At some point, I will take a break and wait for Shannon to catch up. Little did I know, the next 4 kilometers would be nearly excruciating to accomplish. I found myself stopping every 10-15 minutes for a 1-2 minute DEEP breathing break. I have never before hiked such a steep mountain with this amount of weight on my back. Although I thoroughly enjoyed the challenge today, I was left almost completely exhausted. I eventually found a rock at a point that I assumed MUST be very near our place of refuge. I decided this was the perfect spot to take my pack off, hydrate, and wait for Shannon. I say that I found a rock, but it was much, much more than that. This boulder was almost magical, jammed into the side of the mountain and hanging precariously off the side. It was covered in spiny thorns, so I spent about 25 minutes clearing it off with my hiking sticks and a knife. I then precariously crawled onto the rock and enjoyed the greatest view I had had in years. Twenty-five minutes quickly turned into an hour as I sat carefully in my “floating” throne. If I pivoted more than a few inches in either direction, then I would inevitably fall down this very steep section of the mountain; it was exhilarating sitting there! We have read in our El Camino pilgrim guide, that we are supposed to find a rock, at a random location. At whatever point a rock metaphorically speaks to us, we are supposed to began hiking with it daily. This rock is supposed to serve as a source of comfort to deposit all our worries, concerns, and prayers along our pilgrimage. 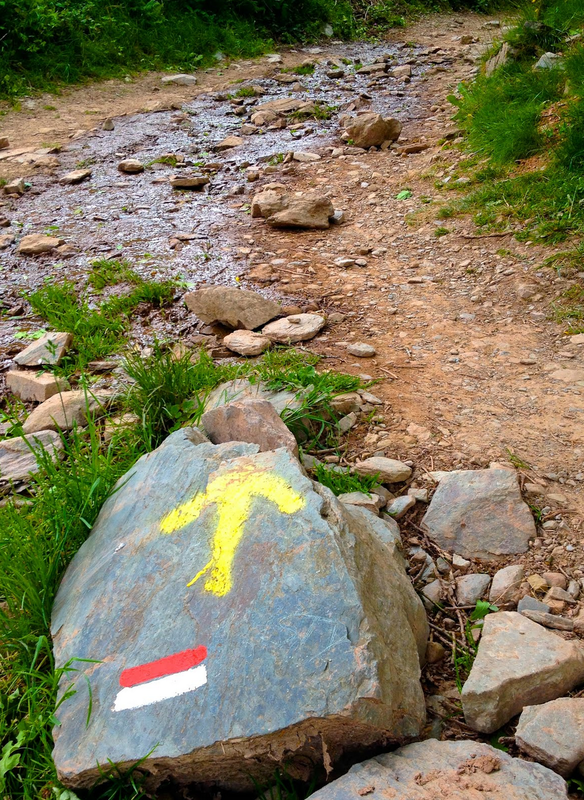 There is a spot near the end of El Camino de Santiago that is supposed to be a sacred, ritualistic place in which to leave our “worrying stone”. 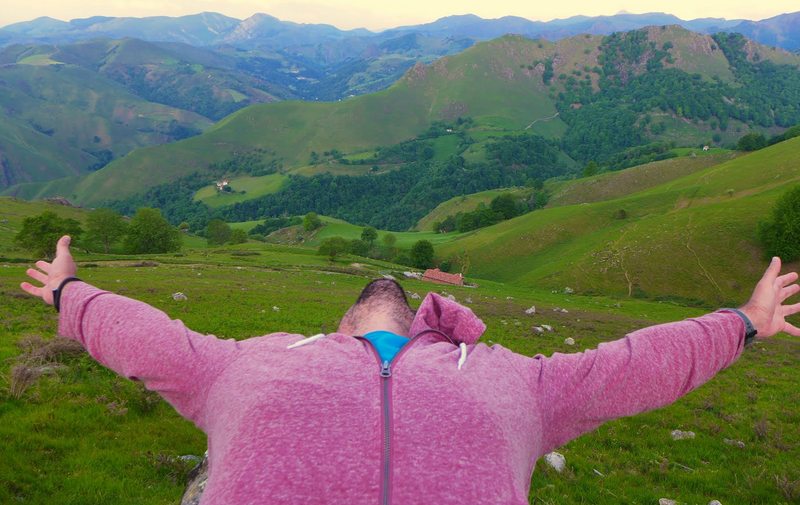 For the first time on El Camino, I felt a powerful, magical moment of comfortable solitude. It was only appropriate, that I pick up my special rock, or piedra, in this significant location. As I sat, my mind began to drift, and I eventually (carefully) lay down in an awkward position to look straight back towards the trees, down the mountain, and up into the sky- upside down. It was frighteningly stunning. I was having the greatest rest ever. But after waiting almost 2 hours, I began to worry that Shannon had not caught up with me yet. Where could she possibly be? I then jumped up in fear, because I realized, as challenging as the day was, it was very possible that Shan was hurt and stranded somewhere along the trail. This was the majestic view from my resting spot, on my “floating” boulder wedged into the side of the mountain. After waiting almost 2 hours for Shan, I hiked almost frantically back from where I came, more than 3 kilometers back down the mountain. I lost a ton of ground in the process and finally gave up, assuming there was no way she could be that far back. So I circled back- back up the steep mountain that I had already hiked. I thought at this point, that maybe Shannon had hitchhiked, and that we somehow missed each other along the path. Then I came upon an awful realization. Three hours earlier, I must have missed a turn which led up a dirt path. I instead continued on the extremely winding, steep highway that originally led me to my boulder. Instead of turning left up this dirt path, I did not realize there was an “X” mark to the right, and I instead continued along the highway. At this point, it was extremely likely that Shannon was already at the place of refuge. And if this was true, she would be extremely worried, that I was not there, since she knew I must have been over an hour ahead of her. All I could think about was that Shannon was probably stressed out by the fact that I was not at the refuge. All I could see in my head, repeatedly, were visions of Shannon crying and freaking out. This in turn stressed me out. I was hiking at the fastest pace I could muster at this point in an attempt to catch up with Shannon. I was exhausted! During a quick break to catch my breath, I turned around and realized for the first time, since trying to correct my mistake, that there was a gorgeous world emerging behind me. I was huffing and puffing at this point. I needed to go faster, but the fuel was quickly draining from my body, and my legs felt like they were going to explode. How many corners of the trail was I going to turn with yet another steep path to traverse? I finally came to the top of this crazy, steep dirt path and onto a concrete road. As I looked to my right, I quickly realized, to my dismay, that my “magical boulder” place of rest, was probably only about a half kilometer to my right, along this winding road. As it turns out, I was indeed almost to our refuge. Had I simply continued forward, I would have inevitably arrived 1-2 hours earlier, and even with my 2 hour break at the boulder, I would have probably arrived around the same time as Shannon! So I took the road to the left, and at almost a crawl, I began the final kilometer assent. After about 5 minutes, a car drove up behind me and began frantically honking. I was too tired to look back, and I simply waved it forward. Then Shannon stuck her head out the window and shouted in glee. Two men speaking only French insisted I jump in the car with them, but after what I had just been through, there was no way I was not going to walk to the finish line on my own two feet! So Shannon jumped out and joined me. As it turned out, Shannon did indeed panic when I was not at the Refuge Orisson. Through frightened, snot-filled tears (according to her! ), she tried to explain to the owner of the refuge, that I must have been hurt. The owner quickly offered Shannon their manual drive car, and since she does not know how to drive a stick, the two French men kindly offered to assist by driving her. They spent the better part of an hour looking for me, and I have to imagine, we must have barely missed each other as I circled back and discovered my mistake, about an hour earlier. It felt awesome to be reunited once again with Shannon. We were both relieved that neither of us were hurt, although both of us were EXHAUSTED! Notice the Basque flag flying above, at a campsite. What do you do after a long day of hiking and getting lost? 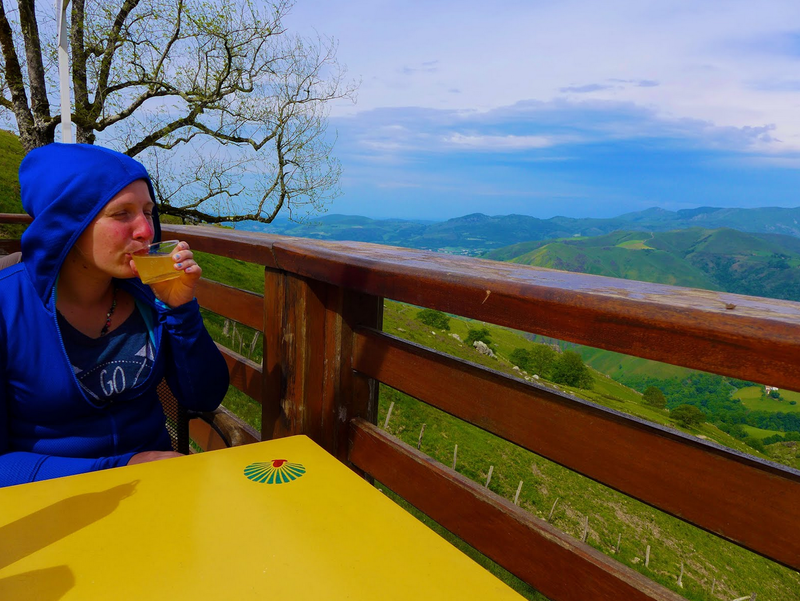 Drink locally-made cider and enjoy the gorgeous views of the conquered day below. At last! What a day. The views alone were worth everything we went through today in finally getting here. What was (only!) supposed to be a steep 8 kilometers today, for me, turned into 13.69 exhausting kilometers. 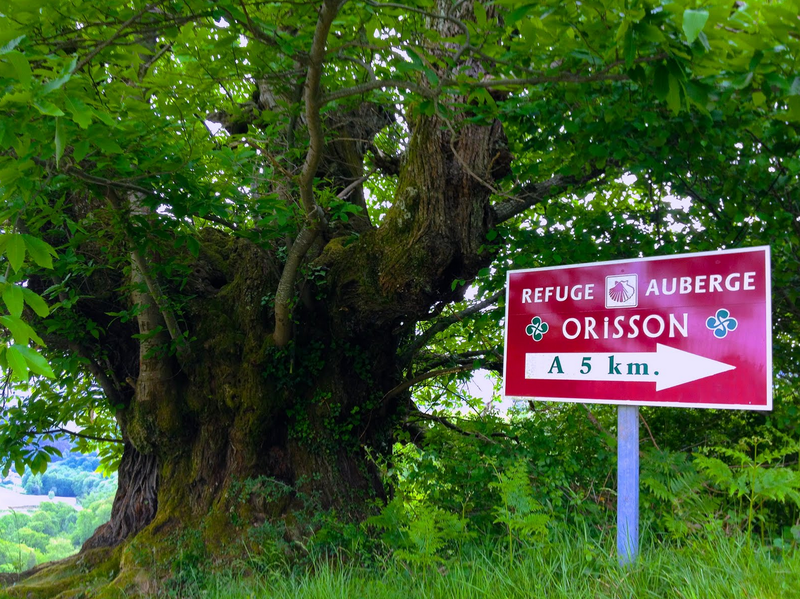 Refuge Orisson was a fantastic place. 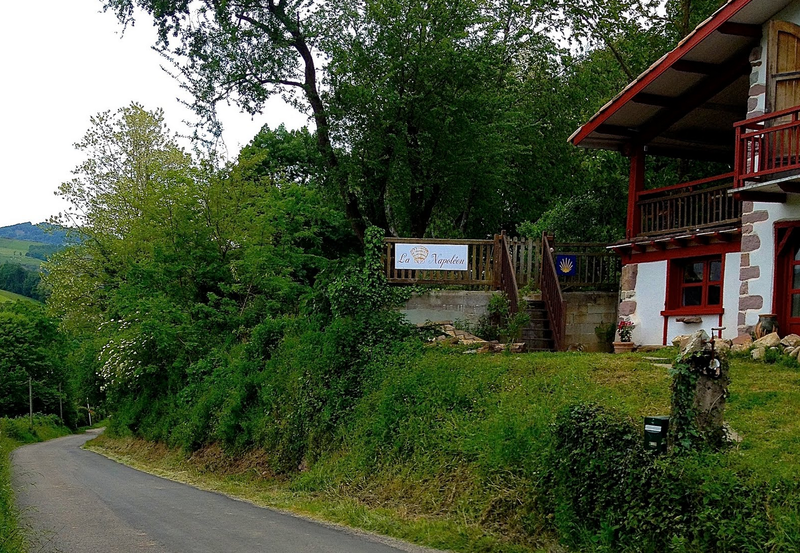 This was our first EVER group albergue experience so far on our Camino. 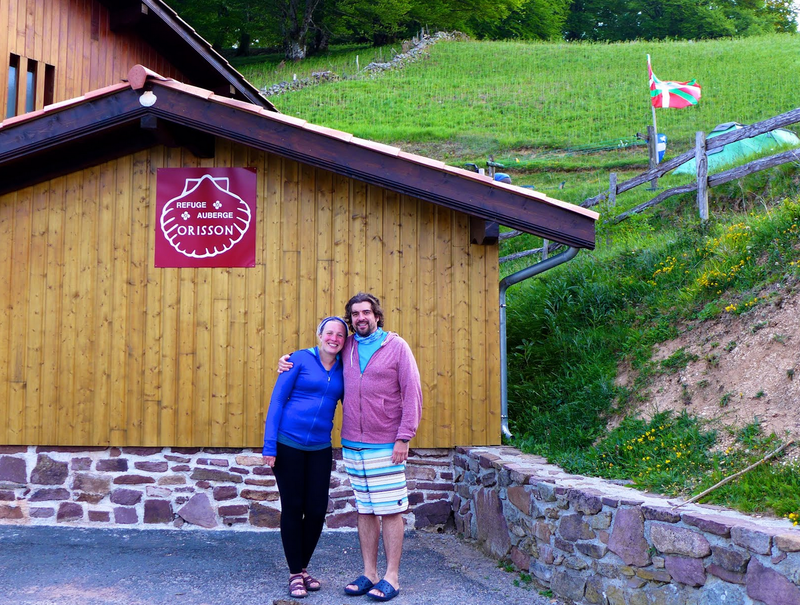 It was such a special place to end our first day in the Pyrenees Mountains. 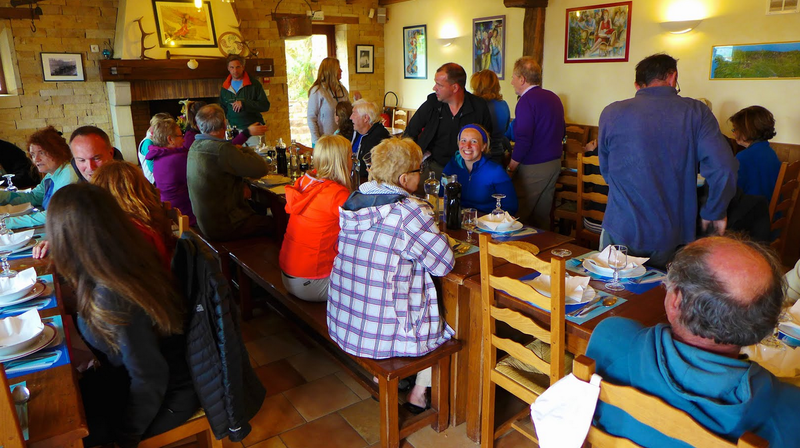 We gathered at long tables full of nourishing vittles and delicious wine, and the owners had everyone stand up and share a bit of ourselves with each other. I cannot imagine a better end to a remarkable and grueling day. ← May 19th, 2014: Today was Day 18 it was scary, funny, and amazing.